Declan Power, a former Irish Army soldier, defence analyst and author, speaks to The42 about the issue. A soldier stands in guard at the Copacabana Beach in Rio de Janeiro, Brazil, Saturday, July 30, 2016. In the aftermath of deadly attacks by the Islamic State group in France and elsewhere, Brazil, which has almost no experience combatting terrorism, is beefing up security for the games that start in Rio de Janeiro today. ONE OF THE talking points ahead of the Rio Olympics is the potential for a terrorist attack. Recent attacks elsewhere, such as last month’s tragedy in Nice, have heightened concerns ahead of the 2016 Games. 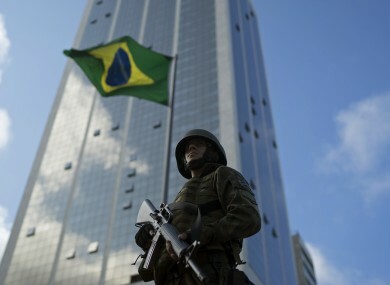 American authorities have aided the training of Brazilian anti-terrorism units, as they prepare for the possibility of chemical and biological attacks, particularly on soft targets away from heavily monitored Olympic locations, such as restaurants, nightclubs and shopping malls. Meanwhile, posts by IS in Portuguese calling for would-be attackers to take inspiration from 1972 Munich attacks have also raised concern of late. In addition, last month, Brazilian police arrested 12 people who were suspected of planning terrorist acts during the Rio Olympics, with the group inspired by ISIS and mainly organised online, according to reports. It is also understood that Brazilian officials have only started to take the potential for a terrorist threat seriously in recent months, with worries over a lack of resources and preparation of security ahead of the 2016 Games. How serious is the terrorist threat at these Olympics? Brazil obviously wouldn’t have the same experience of combatting terrorism as certain other countries and so, does the fact that there’s no real history of it there mean the threat is considerably less than at an event like the 2016 Euros, given that its hosts France clearly had problems previously? Terrorist attacks are largely predicated not so much by the history of the country or its foreign policy positions but by the extent of the Islamic population within that country. That’s what we’ve seen evolved over the last number of years and in particular, the last year. Therefore with Rio and the Olympics, there are various problems and threats, but perhaps this isn’t one of the primary ones. Somebody wanting to carry out a terrorist threat there would not have the same level of population to float through as they would have in France or Belgium. There doesn’t seem to be the same level of radicalisation that has taken place (in Rio) that I’m aware of. I’m sure there may be variations on the themes and the other side of the coin is that it would be seen as a useful target because there are so many countries participating, it would be top of the lists with the likes of the Islamic state (IS). There would be a degree of capability and sophisticated trade craft required that I don’t think exists in IS’s terrorist capability. The nature of the attacks we’ve seen in Europe, they’ve been graphic, they’ve been dramatic, but they haven’t been very sophisticated. It just required people to have the mindset to want to engage in mayhem and terror. What can be learned from terrorist acts of recent years such as the Nice attack last month? An awful lot can be learned from the Nice attack and the other terrorist attacks, because there’s a pattern there. That pattern tells us the dangers of letting any ethnic group that exists within the borders of a country develop in a way that is separate and at odds from the society that it inhabits. The dangers of allowing discontent and disenfranchisement or even the perception of it to fester within a country or a society — that’s the first lesson that I think has been learnt and to be quite honest, it should have been addressed a long time ago. Secondly, the other lesson that has been learnt is the simpler and more random the nature of the attack, the more difficult it is to prevent it by traditional security means. The only way you can have any real hope of dealing with those kind of attacks is to interrupt the cycle of radicalisation that has taken place. More efforts need to be put into understanding the success of the radicalisation process and to interrupt it and to work with the Islamic community, the majority of the Islamic community, who do not want this representation of their religion and culture expressed in such a violent and brutal way. To use them as partners in helping to limit the radicalisation and to identify the signs of radicalisation within the people at risk in the population. It’s a long-term process, but it’s the best way to counter this. Then, of course, enhancing the skills and the resources of the law enforcement, the intelligence and the military sources at their disposal. So going back to the Olympics, the problem there is that the law enforcement institutions don’t seem to be terribly well calibrated or co-ordinated to deal with a lot of the day-to-day security tasks, let alone the anti-terrorism aspect. I doubt they have the particular resources, knowledge or capability of what I was talking about there in terms of deradicalisation. But, on the positive side, I don’t think there is a hugely radicalised internal population. The threat would probably have to come from outside the boarders and coming in to try to plan a terrorist attack in a foreign country is much more difficult than people realise. Reports suggest that Brazil have only in the last few months started to take the possibility of a terrorist threat seriously, but on the other hand, terrorist suspects have been arrested, which would indicate they are not completely blind to the problem. Exactly how prepared are they do you think? As far as I’m aware, preparations are very poor in Brazil, and co-ordination of a lot of resources, let alone security resources, is very poor. A lot of people are not confident at all of how well it will be run. Individual states such as the US, for example, are making their own preparations and I think they will make every effort to protect their athletes and citizens. I know that the US team are supposed to be accommodated on a boat that would be moored offshore. It would make sense from their point of view, it’s a way of being able to totally sanitise that area and maintain the safety of their people. But at the same time, they have to go to and from the events. There’s no doubt about it, it would be a security nightmare for those tasked with dealing with it. I think there will be a lot of assistance at a covert level rendered to the Brazilian authorities, not just from the US, but from other countries, particularly those with a large citizen footprint within Brazil for the period of the Games. It will certainly help to contain matters, but it really it is a very unpredictable situation. What advice would you give to Irish people travelling over? I would be reminding them it’s not so much the immediate threat of a terrorist attack, but there’s a lot of other potential issues and problems that could arise because there would be a lack of co-ordination that could impact on their day-to-day comforts and safety. One of them is a lack of basic patrolled police officers to control the large movements people that you will have at any event. So do your homework, make sure you have checked the Department of Foreign Affairs website for any updates, look at the British Foreign and Commonwealth Office website, which is usually very informative, have the necessary emergency numbers that you might need for the Irish Embassy in Brazil, have details about the Emergency Services locally. Do a little bit of homework when you get there. Where are you going to stay? How far is it from the locations that you’re going to go to? What is your routine going to be? Who’s travelling with you — having their details and having (the details for) their next of kin. Do other people know (the details for) your next of kin? Having emergency numbers for those that are travelling with you. All of those basic things. And when you’re actually going to an event, give it a little bit of thought. Where is it located? Where are the exits if something happens? What are you and the people with you going to do? Where are you going to meet up afterwards to rendez-vous and check that everybody’s alright? You don’t have to overdo it, but having simple prior planning and a few little basic protocols, it helps hugely if you get caught up in some sort of an incident, maybe an overcrowding incident, or some sort of an incident where you have to evacuate the area, and it stops you panicking, because in your head, you have some sort of an idea of what you’re doing and where you’re trying to get to. Finally, what did officials get right at the London 2012 Games four years ago when there were similar concerns, and is the terrorist threat greater now than it was then? If so, why? I think the terrorist threat has changed somewhat and morphed into something at a more basic level and that’s due to the nature of the radicalisation process that the Islamic state have been practicing. They’re not looking to try to do what traditionally terrorist organisations or rogue states did — sending well-trained, capable people into a region. They’re making use of the dissatisfaction of people within a region. They’ve already lived in and are citizens of that region — that dissatisfaction, that sense of disenfranchisement that they have. Luckily for the UK, since 2007, when they suffered their own outrage with the bombing of the Tubes in London, they immediately got to work in trying to address this and they created a synergy between all of the different government services, not just law enforcement, intelligent and military, but all of the different departments in co-ordinating information that could be of benefit or of use. They reached out and into the Islamic community to create lines of co-ordination and communication. They recruited a lot of people from Britain’s Islamic Community into the security services, who understood not just the languages, but the cultural mindset of the people who they’re dealing with. So they’ve been doing a lot of hard work behind the scenes in limiting the numbers of people who could be radicalised and keeping very close tabs on those that they suspected of being radicalised, and doing this with the aid and support of key leadership figures within the Islamic community, and that’s why they were able to prevent any attacks during the Olympics. It was work of that nature rather than the flooding of the area with uniformed security personnel — that’s a cosmetic exercise. It’s needed, don’t get me wrong, but it’s not really what prevents those attacks. So Britain is a unique case, it’s done a lot of heavy lifting. And there a lot of lessons it could teach the rest of us. Certainly, Brazil isn’t in that space, but then Brazil doesn’t have the same level (of threat), I would argue. It may do to a certain extent, but it doesn’t have anything like the same level of enemy within as is the case in the likes of France, Belgium, Britain and indeed Germany to some extent. Email “Irish security expert on Rio's terrorist threat: 'Preparations are very poor'”. Feedback on “Irish security expert on Rio's terrorist threat: 'Preparations are very poor'”.